The Tomb of Askia is a secular monument that shares both the cultural and religious heritage of Mali. The pyramid-shaped tomb also functions as a Mosque and is located in the northern town of Gao. The archaeological site was built by Askia Mohammad I, a famous emperor of Songhai who reigned between the 15th and 16th century. Its architectural design is similar to that of the pyramids in Egypt, that were built in ancient times for pharaohs. “The architect was Egyptian and Askia knew him from Egypt. The pyramid shape you see in the middle of the mosque, is a pyramidal tomb because when Askia went to Mecca, he passed through Egypt, and visited the tombs of the pharaohs”, Traoré said. Ibrahim Maïga has been the custodian of the site. “The piece of wood that you see serves as scaffolding, that is to say, during the days of plastering, the masons climb to the top using the wood. Every two or three years, there is maintenance. It has original woods from which the pyramid was built since 1495 when Askia left Saudi Arabia”. 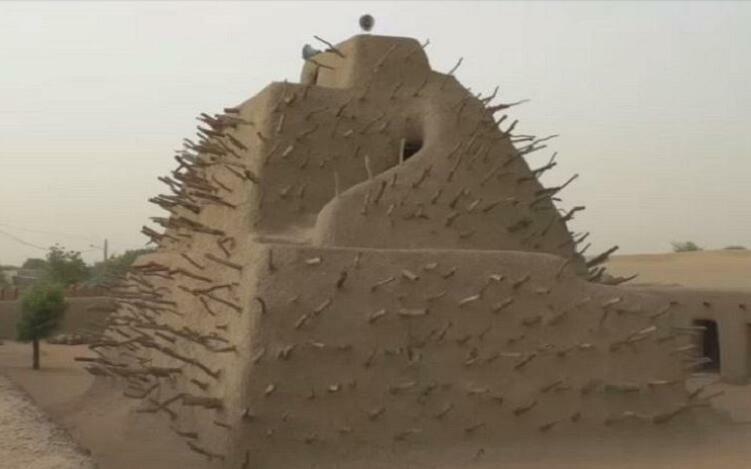 However, the monument nearly collapsed after the 2012 insurgency in Gao, when the region was in control of Tuereg rebels who clashed with the Malian government. But three years later, renovation works resumed to restore its glory. The Tomb of Askia has been a UNESCO World Heritage Site since 2004.